1 media/pr50482_900x900_b_p_061526_by_design_by_humans-d7ss3og.jpg media/pr50482_900x900_b_p_061526_by_design_by_humans-d7ss3og.jpg 2016-01-17T19:24:02+00:00 The Tree of Life 14 gallery 2016-02-20T12:37:42+00:00 The Tree of Life is a common motif in many mythologies. There is not a consistent purpose for the tree of life, some of the more common purposes are giving life to the original gods or humans and connecting different worlds. 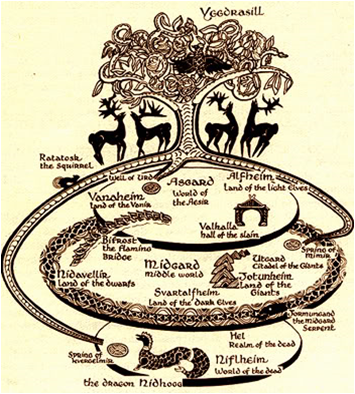 Some popular versions of the tree of life in the Garden of Eden, Yggdrasil, the Norse tree of life that connects different worlds, and the Celtic tree of life at the center of the Celtic Otherworld. Genesis 2:9 claims, “And the Lord God made all kinds of trees that were pleasing to the eye and good for food. In the middle of the garden were the tree of life and the tree of the knowledge of good and evil.” Not much is known about the tree of life in the bible and it is debated whether or not the tree of life and the tree of the knowledge of good and evil are two separate trees or they are the same tree. In Norse mythology, Yggdrasil is an enormous ash tree that connects different worlds together (please see image 1 in the gallery at the top of the page). Formed from the words, “ygg” and “drasil,” the tree’s name means terrible steed. This description is accurate since it is said that Odin “rode the gallows” in order to acquire knowledge. 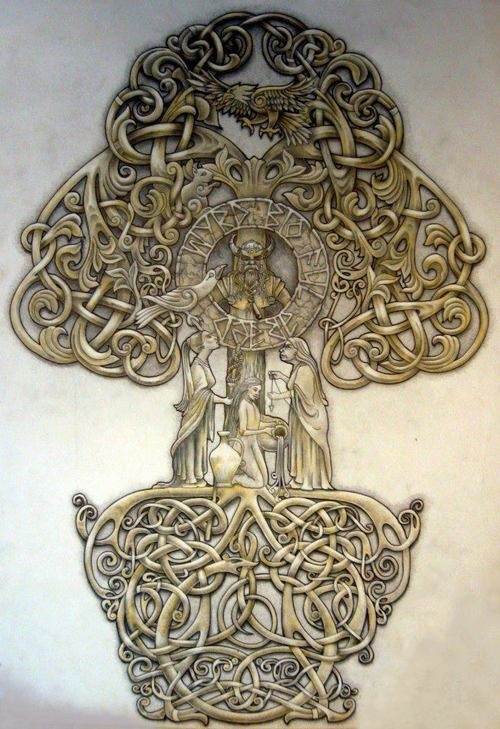 Also extremely popular is the Celtic tree of life (please see image 2). A tribe would clear away forest for their settlements but would always leave on tree in the middle of their community. This would be their Tree of Life where chieftains were inaugurated and to cut it down deserved the worse punishment. The tree was also said to be key to accessing the Celtic Otherworld. The most common symbol representing the Celtic Tree of Life is interesting because it also involves interlacement. It is representative that the tree gives life and death and that we are in a never ending cycle (please see Image 3). This style and themes are present in the majority of mythologies surrounding the tree of life. In Estoire del Saint Graal, the tree of life grew from a branch of the tree of knowledge of good and evil that Eve carried out of the Garden of Eden when she was cast out. This tree represented a multitude of emotions throughout its existence being called the tree of death, the tree of life, and the tree of help and comfort. It turned different colors according to humanity’s actions including white for purity when Adam and Eve were first cast out, green for fruit when Abel was conceived, and red for bloodshed when Cain killed Abel. The tree is tied to humanity and used by Solomon in the creation of his ship. The text depicts the tree of life as a direct link to God which changes based on mankind's relationship with him. In addition to the relationship with God, the tree's symbolism of unity and connectivity between everything in the world indicates a mindset of predestination. Predestination in the text is further supported by the various prophecies and advice in the text. The tree confirms the various Christian influences in Estoire del Saint Graal and shows how the entire story is rooted in religion. In recent years, the tree of life is a common concept that has come to represent the cycle of life and how all parts of our lives influence one another. In 2011, Terrence Malick created a movie called Tree of Life (please see video 1 in the gallery at the top of the page). The movie features a "tree of life" in the main character's backyard showing how there are things in his life that remain the same. Furthermore, the movie is atypical in its format representing the difficulty in understanding life.